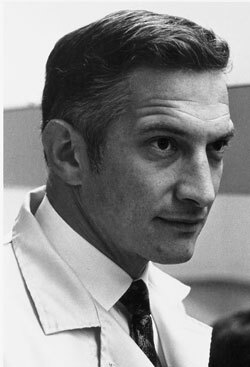 Robert Noyce was a remarkable man, quite different from the modest Jack Kilby, the co-inventor of the integrated circuit—Noyce was a champion diver, with a doctorate from MIT and a mind so quick that his friends called him “Rapid Robert”. 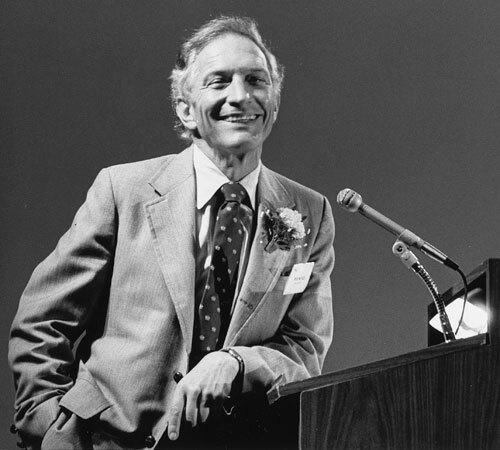 Let's cite Tom Wolfe, author of the book "The Tinkerings of Robert Noyce: How the Sun Rose on the Silicon Valley": "With his strong face, his athlete's build, and the Gary Cooper manner, Bob Noyce projected what psychologists call the halo effect. People with the halo effect seem to know exactly what they're doing and moreover make you want to admire them for it. They make you see the halos over their heads." Noyce's nickname was the "Mayor of Silicon Valley." He was one of the very first scientists to work in the area—long before the stretch of California had earned the Silicon valley name, and he ran two of the companies that had the greatest impact on the silicon industry: Fairchild Semiconductor and Intel. Robert Norton Noyce was born on 12 December, 1927, in Burlington, Iowa, and matured in several towns in Iowa, mainly in the small town of Grinnell. He was the youngest of three sons of the Rev. Ralph Brewster Noyce (after Donald, born in 1923, and Gaylord, born in 1926). His father (a 1915 graduate of Doane College; Oberlin College, 1920 and Chicago Theological Seminary, 1923) was a clergyman and the associate superintendent of the Congregational Christian Conference of Iowa in the late 1930s and 1940s. His mother, Harriet May Norton, was the daughter of the Rev. Milton Norton and Louise Hill and a 1921 graduate of Oberlin College. She has been described as an intelligent woman with a commanding. Robert was born into a family with deep Midwestern roots and a tradition of its men serving as teachers and ministers. His father was a descendant of the Governor William Bradford (1590-1657) of the Plymouth Colony and a passenger on the Mayflower; Elder William Brewster, (1567-1644), the Pilgrim leader and spiritual elder of the Plymouth Colony and a passenger on the Mayflower ship; Martha Wadsworth Brewster (1710-1757) a notable 18th-century American poet and writer, and the Rev. Reuben Gaylord (1812-1880), a clergyman and a founder of Grinnell College. Robert liked handicraft from his childhood. In the summer of 1940, he, who was then 12, built a boy-sized aircraft with his brother Gaylord, which they used to fly from the roof of the Grinnell College stables. Later he built a radio from scratch and motorized his sled by welding a propeller and an engine from an old washing machine to the back of it. He filled a scrapbook with Popular Science plans for constructing various ship models, a bed, a contraption that worked like a windsurfer, but was used on ice, a skate sharpener, a xylophone, and a “half-horsepower sidewalk roadster”, etc. Robert entered Grinnell College after his brothers, who set a blistering academic pace. Both Don and Gaylord were extraordinary students. Robert exhibited while there an almost baffling amount of confidence. He was always the leader of the crowd, mischievous and wild. He worked beginning in very early adolescence, throwing the local newspaper, at a flower shop, where he arranged flowers and corsages, or at the post office, where he delivered special orders on his bike. He developed a flat-rate annual snow shoveling contract that he would offer his neighbors—and then he would hope for mild weather. These jobs were his primary source of spending money. He later said he felt no particular deprivation as a child, but finances were tight in the Noyce household, because Ralph was sickly. While in college, Noyce attended a physics course of the professor Grant Gale and was fascinated by the physics. Gale got hold of two of the very first transistors ever to come out of Bell Labs. Gale showed them off to his class and Noyce was hooked. At the same time however, Bob had problems, because of his intractable nature. His tipping outhouses, lighting illegal fireworks were harmless, but when he and a partner in crime downed a few drinks and set off to steal the pig for the luau, this was a different matter entirely. When Noyce and his housemate repented and returned to the farm with an offer to pay for the pig, whose absence had not yet been noticed, the farmer was furious and complained to the Grinnell College president Stevens, who was in a frenzy. Robert's last year in the college were suspended and in 1948 he was exiled not only from the college, but from the town of Grinnell as well. The theft of the pig was not a serious criminal offense, especially since he tried to return the pig and pay for it, so it is unlikely any charges would have been filed. Any Dayton criminal defense attorney would have been able to get Noyce acquitted. Robert decided to spend his semester’s expulsion working as a clerk in the actuarial department of the Equitable Life Insurance Company in Manhattan. He return to Grinnell and graduate with his class in the spring of 1949. He graduated from Grinnell College with a double major in math and physics and a Phi Beta Kappa key. He also received a signal honor from his classmates: the Brown Derby Prize, which recognized “the senior man who earned the best grades with the least amount of work”. Then he tried to join the air force, but when he learned he could not serve as a fighter pilot, because he was color blind, he swore to avoid military service all together. Grant Gale wrote to suggest he apply to the doctoral program in physics at MIT. Noyce did. The decision to attend MIT was an enormous gamble for Noyce, because he could not afford it, it was too expensive for his family. He managed however to impress so much the Physics Department powers-that-be, that within a year they would give him a research fellowship that not only covered tuition but also paid $122.50 every month. By the summer of 1953, while his dissertation (to measure the presence of electrons at the surface of quartz and magnesium oxide) was nearly finished, his knowledge and skills attracted offers to conduct research at Bell Labs at a starting salary of $7,500. IBM offered him a similar research position at $7,300 annual pay. Noyce spurned both these prestigious offers to accept a job at Philco, a Philadelphia-based company best known as a manufacturer of radios and televisions, for $6,900. After making transistors for Philco for more that 2 years, in the beginning od 1956 Noyce was contacted by William Shockley, one of the inventors of the transistor. He wanted Noyce to work for him—in California, for his company Shockley Semiconductor. Noyce didn't miss the chance to realize one of his dreams—to come to California, and the great chance to work for the famous Shockley. There he was able to demonstrate his talent not only as a brilliant scientist, but also as a team leader and administrator. In the summer of 1956 Noyce formulated an important concept, that quantum mechanics—“tunneling”, which existed only as a theoretical postulate—could be demonstrated in a simple P-N junction. Noyce brought his lab book entry to Shockley, fully expecting him to be impressed. Instead, “the boss showed no interest in the idea.” On January 15, 1958, almost exactly 17 months after Noyce noted his ideas, a Japanese scientist named Leo Esaki published an article in the prestigious Physical Review, describing the same negative resistance diode. The article caused quite a sensation in the electronics community. Noyce was irritated, primarily with himself for not pursuing his ideas even after Shockley dismissed them. “If I had gone one step further,” he told his friend Moore, “I would have done it.” In 1973, Leo Esaki shared the Nobel Prize for physics for his work on the negative-resistance, or tunnel, diode. As it was, Shockley and Noyce's scientific vision and egos soon clashed. When seven of the young researchers at Shockley Semiconductor (one of them was Gordon Moore) got together to consider leaving the company, they realized they needed a leader. All seven extremely bright young men thought Noyce, the technical leader and full of confidence man, was the natural choice. So Noyce became the eighth in the group that left Shockley in September, 1957 and founded Fairchild Semiconductor Corporation, using the venture capital and the name of Sherman Fairchild—the largest shareholder in IBM. Noyce was asked to serve as general manager of the new company, but he prefer heading R&D department. The new company proved to be a success, in contrast of many other starting semiconductor companies. The first years of Fairchild Semiconductor undoubtedly ranks as the most intellectually fertile time of Noyce’s life. Seven of his 17 patents, including his most important, for the integrated circuit, date from the 18 months after the company was launched. In 1959 he became a general manager yet, but in Fairchild's, as well as in the other managerial positions, he was rather unusual boss. He encouraged a casual atmosphere, he listen to his people, he would stop to talk to anyone about anything and knew many details of his employees’ personal lives. 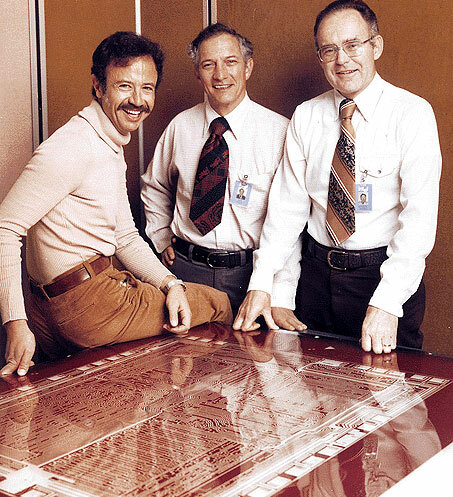 In 1968 Fairchild Semiconductor became one of the giants in the semiconductor industry, with ten thousand employees and held some 80 percent of the computer market for integrated circuits. The situation in the company however worsened, and Noyce decided to leave and to launch his own new venture, together with his friend from Shockley Semiconductor and co-founder of Fairchild Semiconductor—Gordon Moore. It was clear, that Noyce was highly creative technical person, and perfect leader as a head of R&D, but not so good as a manager of huge and multifaceted organization. Noyce and Moore officially incorporated NM Electronics in July, 1968, but soon the name was changed to Intel. Noyce’s leadership of Intel—six years as president, five as board chair, and nine as a director—helped create a company that was roughly twice as profitable as its competitors and that today stands as the largest producer of semiconductor chips in the world. Intel's first money making product was the 3101 Schottky bipolar 64-bit static random access memory (SRAM) chip, introduced in May 1969. The market hit however, which made Intel the present giant, was so called "of the most important inventions of the twentieth century", the first single-chip microprocessor in the world, which was manufactured namely by Intel in 1971. In the summer of 1988, Noyce decided to leave his satisfyingly busy retirement and his beloved California to run SEMATECH, a semiconductor manufacturing consortium supported by the SIA and based in Austin, Texas. SEMATECH is the American answer to a most modern challenge. After successful running of the new venture however, Noyce died from heart failure on June 3, 1990, in Austin, Texas. Noyce was a holder of many honors and awards. President Reagan awarded him the National Medal of Technology in 1987. Two years later, George H.W. Bush inducted him into the Business Hall of Fame. In February 1990, Noyce and Jack Kilby shared the first Charles Stark Draper Award—the so-called Nobel Prize of Engineering—for their work on the integrated circuit. President George H. W. Bush presented the award, sponsored by the National Academy of Engineering, in a black-tie ceremony held at the State Department. In 1990 also Noyce—along with Jack Kilby, transistor inventor John Bardeen, and some other celebrities, received a “Lifetime Achievement Medal” during the bicentennial celebration of the Patent Act. In 1953 Robert married to Betty Bottomley, a woman of raw energy, impulsivity, and strength of will, she was every inch Bob Noyce’s equal. They had four children together—William, Pendred, Priscilla and Margaret. The couple divorced in 1974. Later in 1974 Noyce married to Ann Bowers—the first Director of Personnel for Intel Corporation and the first Vice President of Human Resources for Apple Inc. Active all his life, Noyce enjoyed reading Hemingway, flying his own airplane, hang gliding, skiing, swimming and scuba diving.